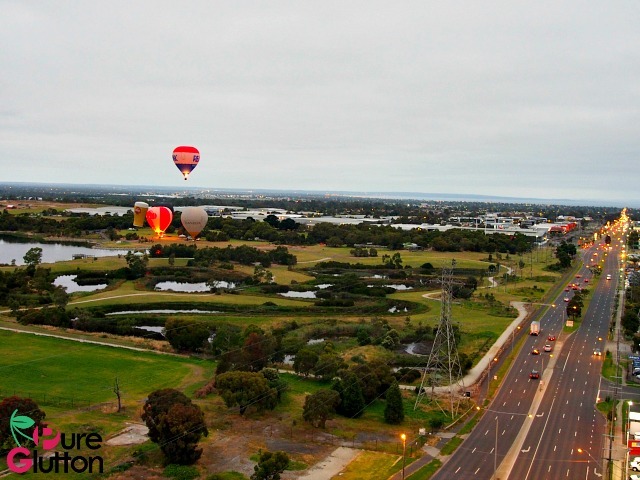 Flying with the wind in Melbourne the Global Ballooning way! How would you like to “move with the wind”? That’s not a clichéd phrase. 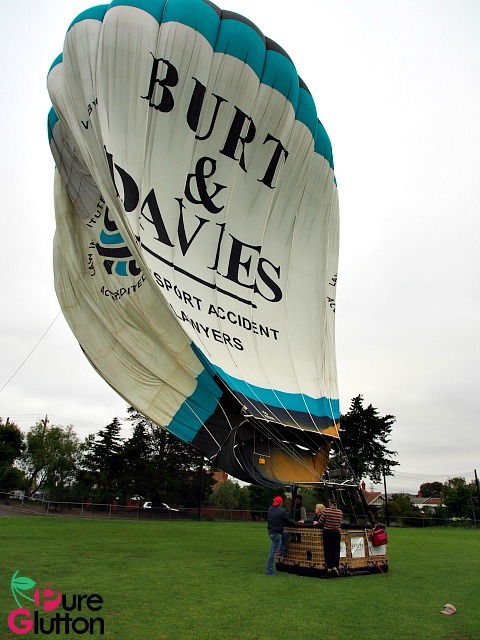 That is exactly what happens when you go ballooning. 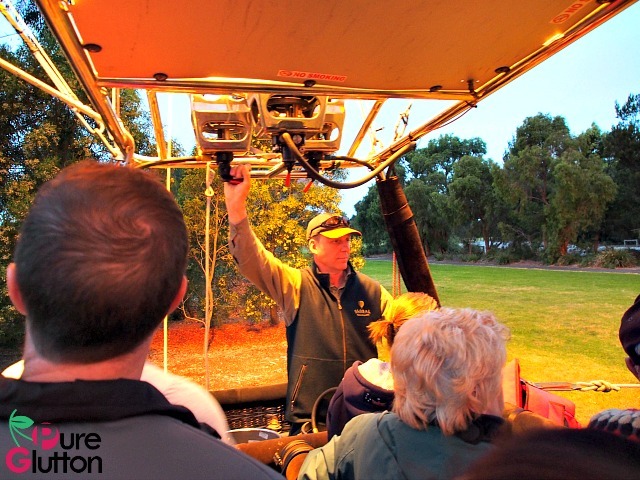 This activity may not be very common here in Malaysia but in Melbourne, Australia, it is an attraction that’s readily available. 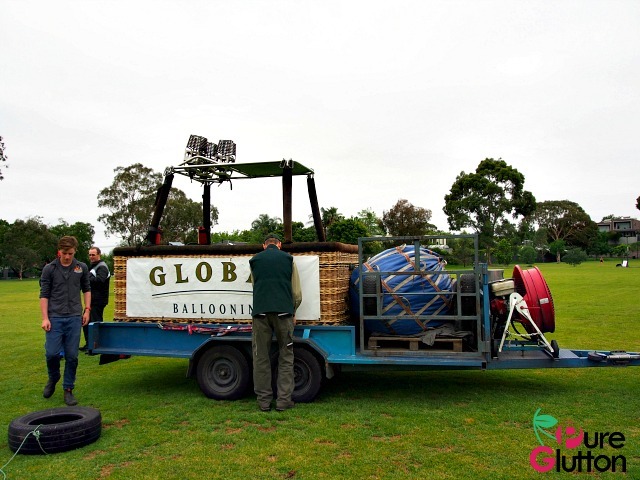 There are quite a number of ballooning operators in Australia but one of the premier and preferred ballooning operators there is none other than Global Ballooning. 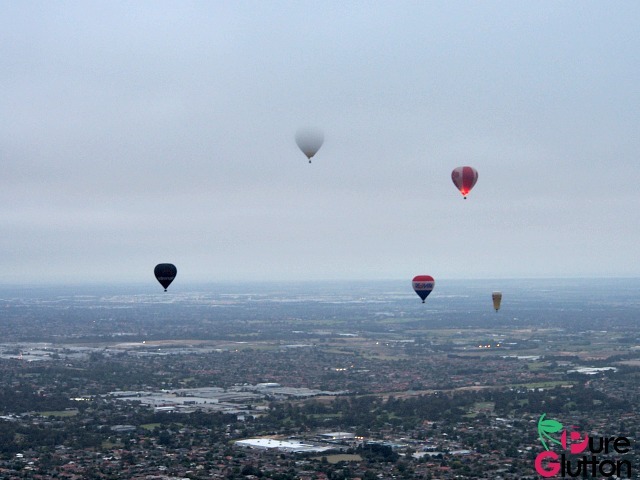 Actually, my encounter with Global Ballooning in Melbourne started back last August when I was offered a ride in their balloon over the Yarra Valley. That was towards the end of winter in Down Under. A date was booked. 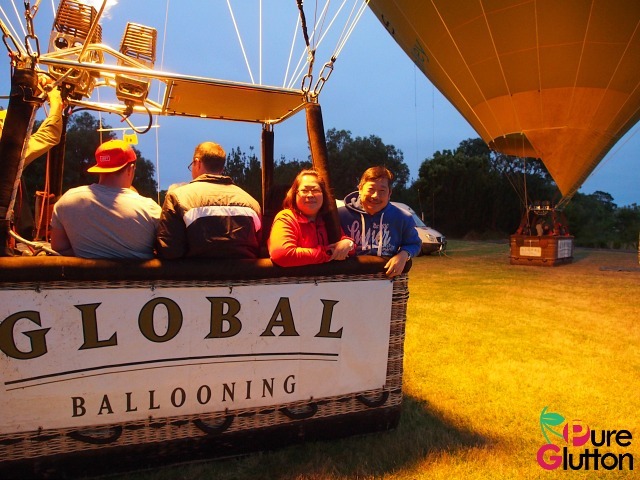 Now, Global’s procedure is that all booked passengers must call the pilot on the evening before the ballooning is to take place. I did just that and was informed that Australian weather being so unpredictable, I had to call again the next morning at 3am to get the latest update on whether the flight will proceed or not. So I set my alarm to 3am and when I sleepily dialed the number given, the recorded message from the pilot was “No Go”! 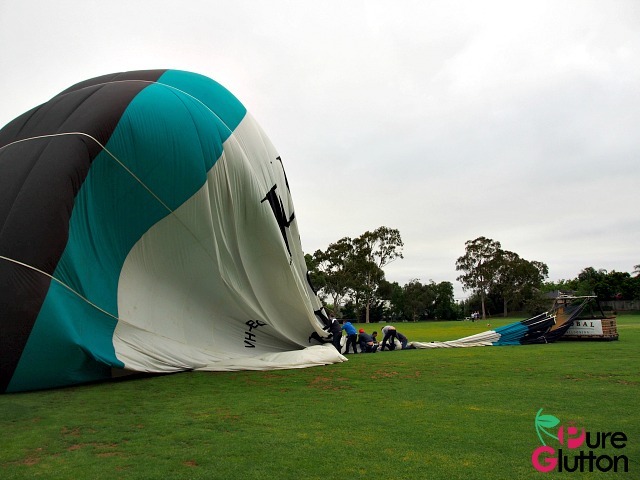 Weather conditions that morning did not permit safe ballooning and with safety being their No.1 Priority, Global Ballooning had to cancel that morning’s flight. 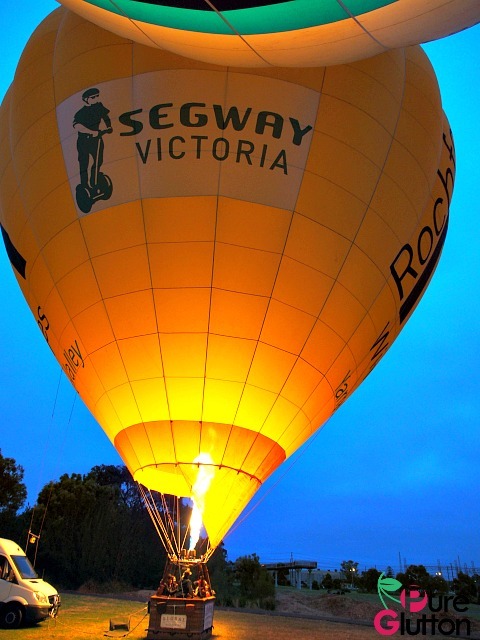 Bummer – I had been so looking forward to gliding above the hills and vineyards of the Yarra Valley! So, in my following trip to Melbourne, which was last month, another date was booked for us but this time the flight would be over Melbourne city. Again, the same procedure – call the pilot the evening before and on the morning itself at 3am and this time, I heard the pilot’s voice saying “Yes, the flight is on!” Yayyy! I woke D up and both of us pulled on our clothes (almost half asleep). Even though it was summer in December, we were advised to wear warm clothings and sensible shoes. The pick-up point was at the Hilton On-The-Park. When we made our way to the hotel lobby, I was surprised to see a pretty big group of people already waiting there and the crew and pilots from Global Ballooning (in their smart vests and caps) busy registering the passengers. Once registration was done, we all piled into their vehicles and taken to the launch site, some 20 minutes’ ride away. 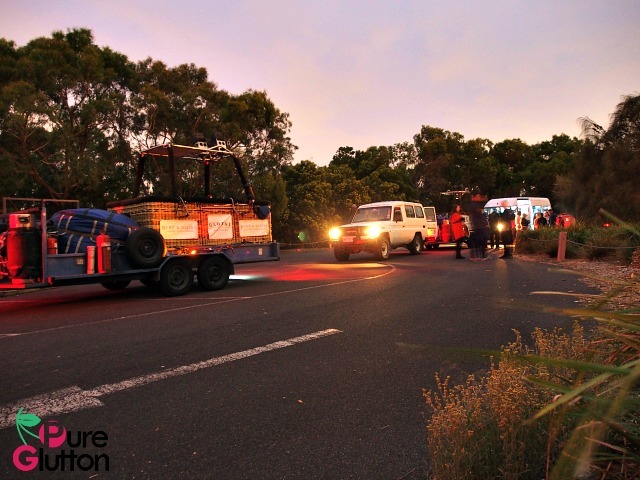 It was still dark when we alighted from the vehicles – time was just after 5am. Arriving at the launch site – it’s still dark & kinda chilly! There were 4 balloons going up that morning. 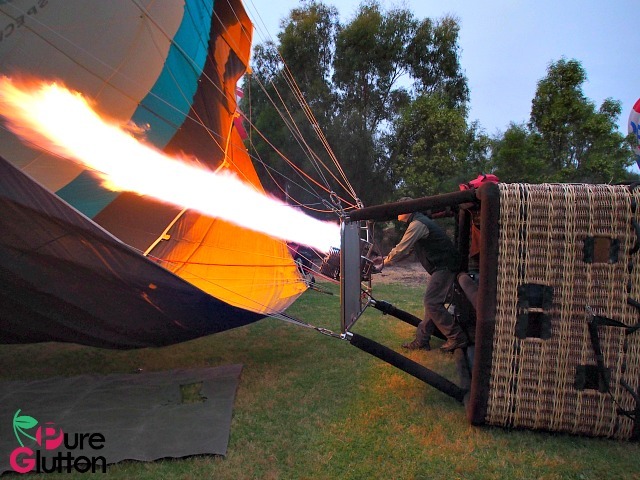 Each balloon basket can accommodate a maximum of 10 passengers, excluding the pilot. 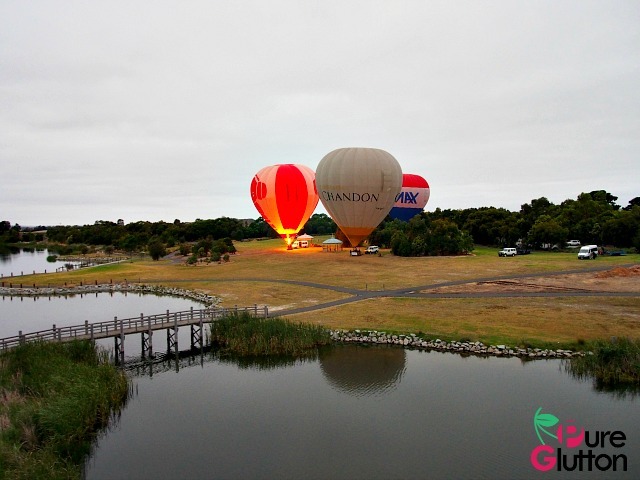 I was so glad that our pilot was Kiff Saunders, who is Global Ballooning’s Chief Pilot, a hot air ballooning trainer and examiner. Yes, we were in good hands. Oh, did I mention that Kiff also started Global Ballooning back in 1991? We were briefed by Kiff on all the procedures to be followed, to ensure a safe and pleasant flight. 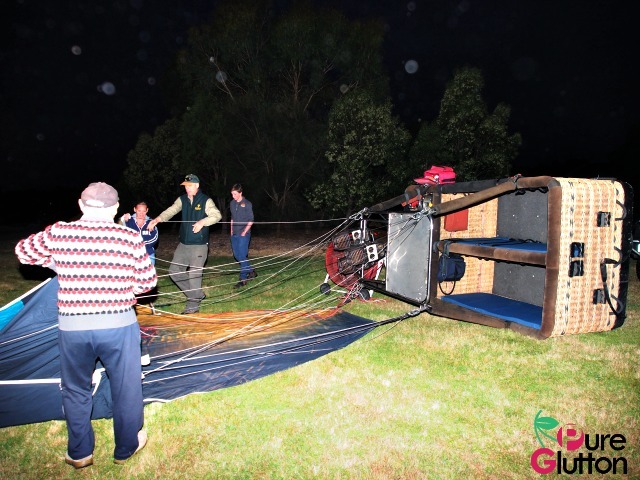 Kiff and his crew couldn’t emphasize enough that ballooning is a participative activity – meaning, the passengers are encouraged to help out in setting up the balloons. 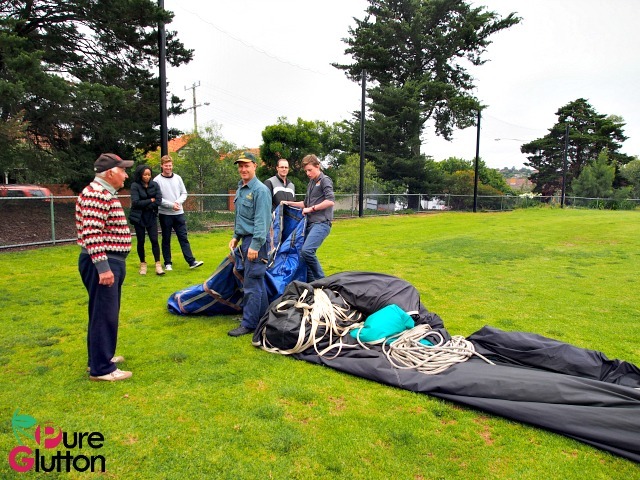 The guys took down the folded nylon balloon and unrolled it on the ground. 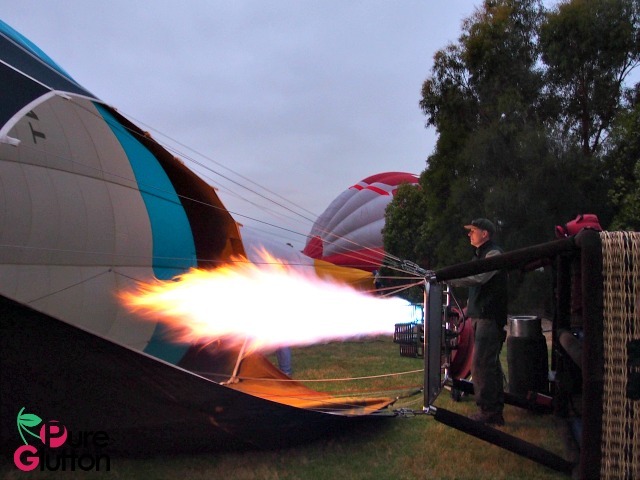 Kiff then blasted LPG which generated the necessary heat to lift the balloon. As more heat is blasted, the balloon billowed up, took shape and then Kiff gave the signal for us to climb into the wicker basket. 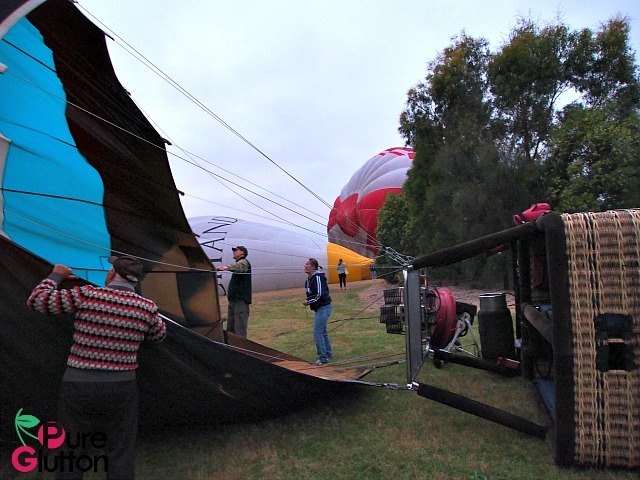 It’s so exciting to see the balloon slowly taking shape and moving into an upright position! 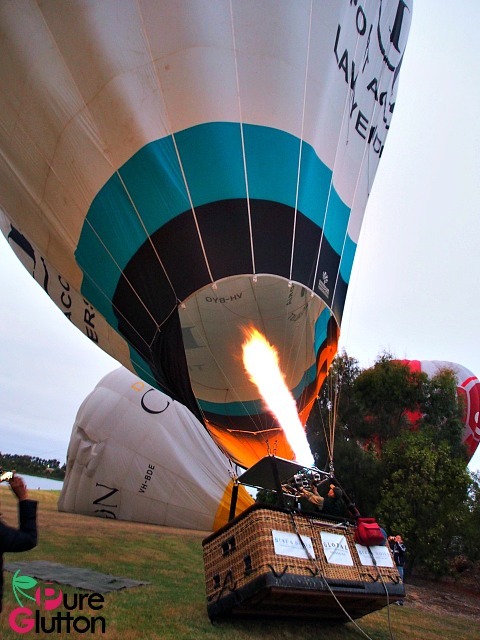 Before long, the whole balloon was upright and finally our pilot came onboard and with a few more jerks of the LPG blaster, I felt the balloon floating slowly up. 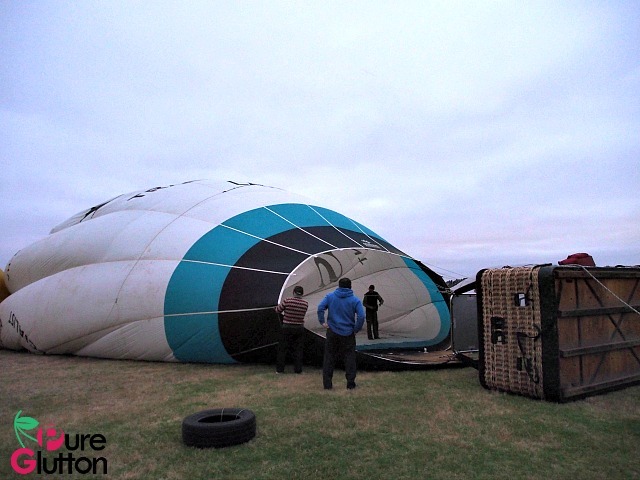 It’s an exhilarating feeling – the wicker basket with 10 adults in it felt weightless as we rose with the wind. 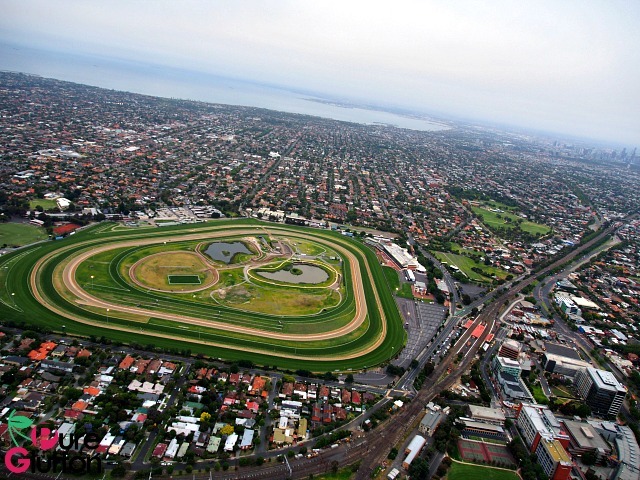 As we rose higher and higher, the city of Melbourne spread out like some toy town below us. The other balloons started to rise too. As we gazed around the scenery below and beyond us, it’s quite ethereal as it’s so silent and peaceful. The sky was not completely clear that morning and at one point we floated right into thick clouds and suddenly we were in this cocoon of grey nothingness! It’s like we were suspended within a fluffy wall and we couldn’t see anything except at each other in that basket – pretty scary. I heaved a sigh of relief when we floated out of those clouds and the city was once again visible. 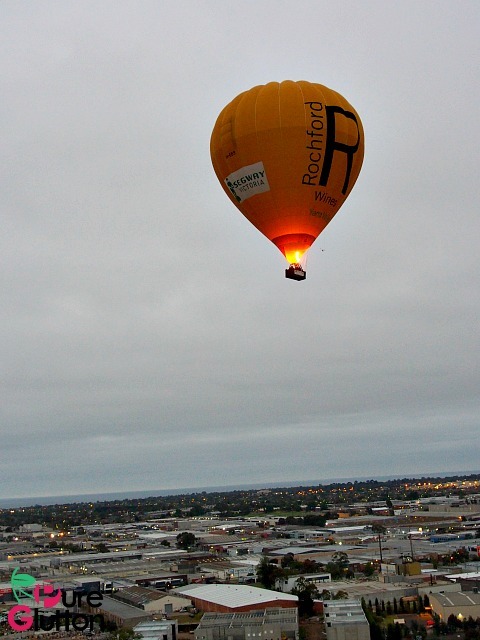 The balloon dipped and rose at intervals – at some low levels we could actually peer into people’s backyards and see what’s happening there! 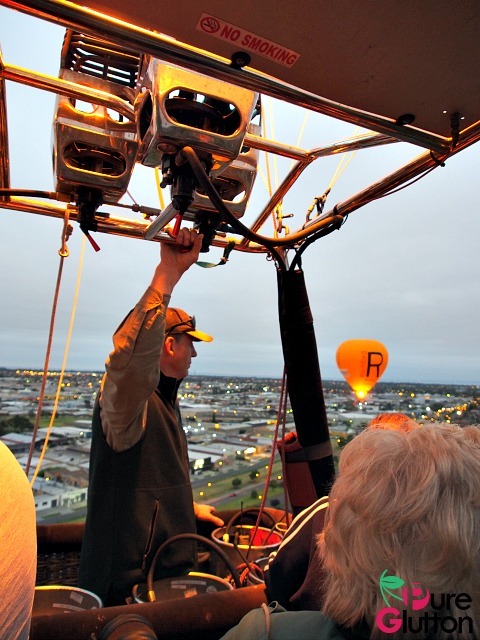 The wind direction varies at different heights and by flying at different altitudes, Kiff uses his expertise to maneuver the balloon in tandem with wind speeds and directions to steer the balloon to the desired destination. It looked easy enough but that kinda smoothness takes years and years of experience and skills. Considering there’s no “engine” in the whole contraption, it’s all about Kiff’s skills and experience to control the balloon, which is really awesome. We are in good hands for sure! 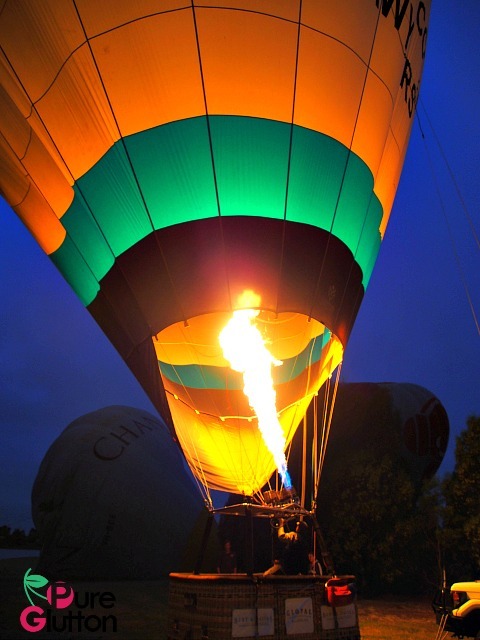 We were airborne for almost an hour, reaching a maximum altitude of about 2,300ft that morning. Kiff identified the field to land and started the descend procedures. 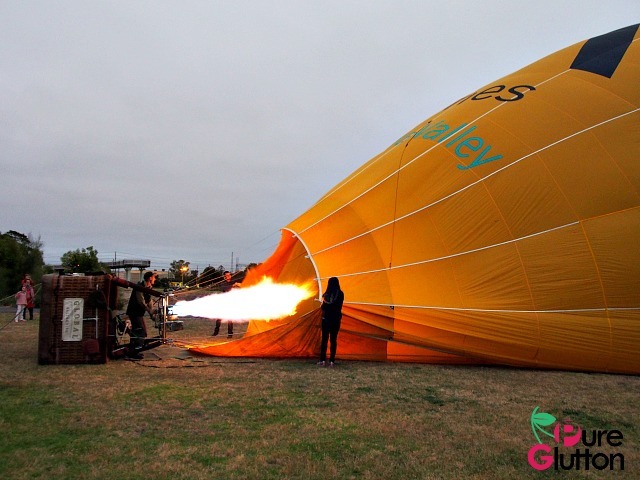 It’s darn amazing how he “steered” the balloon to the direction of the field and we landed gently right on the spot – in the middle of the field! Flatten and roll, repeat many times over :-)… that’s the way to do it. See – everything is packed and fitted snugly into this bag! We clambered out of the basket and proceeded to help pack up the balloon. I got to perform the very-critical task of holding up the bag as the guys rolled up the balloon and packed it tightly into the bag. Then, in just a couple of minutes, the neatly tied-up bag together with the wicker basket, were tipped onto the back carrier of the 4WD vehicle and off we went. We headed back to the Hilton On-the-Park for a champagne breakfast. 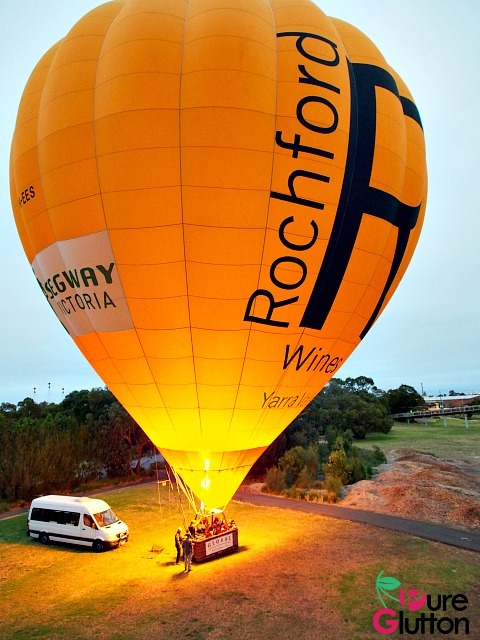 If you are heading to Melbourne, a balloon ride over the city or Yarra Valley is an experience that’s not to be missed. 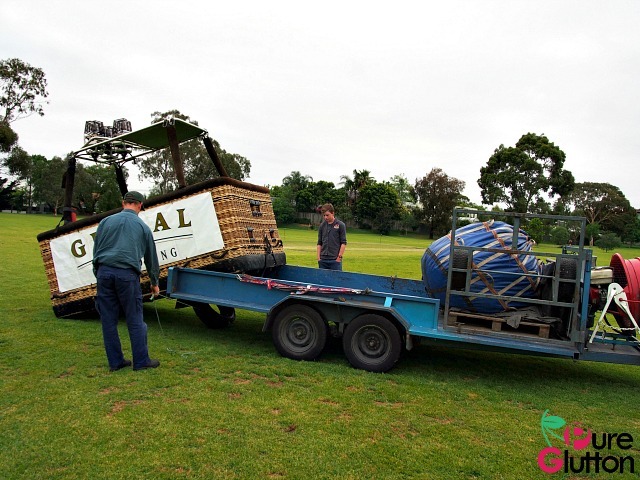 The people at Global Ballooning are professionals in their jobs. 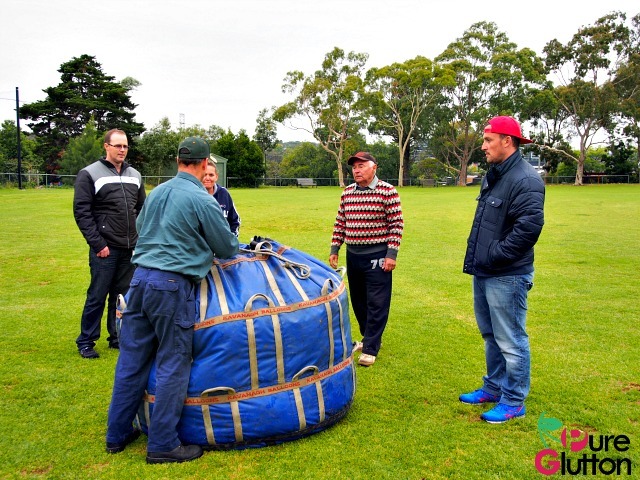 Safety is their priority as Global Ballooning is regarded as Australia’s most credentialed ballooning company. With an impressive record of 25 years in the business and flying more than 110,000 passengers safely, you can be assured you are in good hands. Besides, you’ll be having lots of fun in that quiet peaceful flight! Thanks, Sean! Yeah, we’re looking forward to more of those!